How many users hit your website last year? What is the expected increase in traffic this year? Do you have enough capacity in place to handle the load? Be proactive. Setup realistic website load tests to run against your critical website before the site hits critical mass. 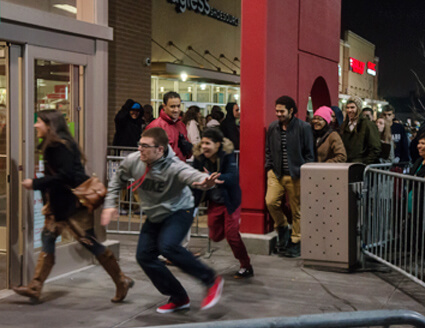 In recent years even large retail websites such as Target and Best Buy have struggled under heavy visitor loads during the Black Friday weekend traffic. According to Tamara Gaffney, a principal analyst at Adobe Digital Index, on Cyber Monday 2015 “Online traffic was so astronomical that several retailers experienced temporary outages and slow checkouts, but that didn’t stall consumer spending.” However, it may have caused those consumers to move on to the next website to complete their purchase. How much revenue does a large consumer website risk losing if the website is not working properly on the biggest shopping days of the year? The loss in potential sales goes well beyond ecommerce shoppers to include customers visiting brick and mortar stores who simply want to know if a product is available in their local store. Technology continues to advance, but unfortunately so do the threats against our networks. Anyone who relies on their websites and networks to generate revenue or support business operations needs tools to proactively, and continuously test environments for bottlenecks, points of failure, and weaknesses. Even if you are safe from the usual attacks, at some point your website could become overwhelmed by an over-abundance of normal visitors. Do you know what that threshold of simultaneous visitors is on your website? The Load testing platform LoadView can engage machines in multiple cloud networks to emulate thousands of users accessing your online services at once. Whether you are testing your software as a service (SaaS), online shopping cart path to purchase or other online services, LoadView provides the tools to test the capacity of your environment. Make sure that you know how your services will respond under different levels of user load by running variable numbers of simultaneous user interactions with your site and generate valuable reports on how the website responded from the users’ perspective. Perform load tests at all layers of your infrastructure. Depending on how your infrastructure is set up, you may be able to point a test at individual servers to determine the maximum load per server as well as the front line load balancer to determine overall system degradation as the number of users scales up. LoadView can be set up to perform simple page requests or much more detailed scripts of user behavior. By using the Everystep point and click tool to record a user interacting with your website, you can recreate those actions during a load test from thousands of simultaneous users at once. This gives you a more realistic vision of actual users browsing the website than simply sending http get requests to the server. Combine the LoadView tests with other Dotcom-Monitor tools such as MetricsView to gather data about how CPU, memory, network bandwidth and Disk IO performed under the load. Viewing stress test results alongside Windows performance counters can pinpoint elements that cause undue stress on the hardware as well as the point where the hardware is maxed out. LoadView also captures video records of your website performance under heavy load. Recording page load speed in a real web browser allows you to watch how load and render times are affected during load testing. The waterfall chart generated along with the video capture lets you view the response time of every single element on your website when you hit peak traffic so you can determine which elements need to be optimized. Optimization of such key elements can include shrinking image file sizes, performing code optimization and compression with a tool such as minify, and working with a Content Distribution Network (CDN) to distribute the elements to multiple remote servers. Load testing a website from inside your own network is relatively easy. LoadView adds the value of load testing your website from multiple locations around the world to ensure that your services and websites are available to all of your customers no matter where they are. It is vital that you obtain an external perspective of your services so that you are not lulled into a false sense of security by only viewing performance from within your own network. Distributed load testing can also show you how 3rd party elements such as CDN hosted content perform from each geographic region. Ultimately, control over an IT environment is only as good as the visibility you have into the system performance, and if you have ever experienced unexpected outages, then you know how valuable tools are that provide that proactive insight. At the very least, LoadView can provide you with baseline acceptable performance metrics, and at most, you can determine the peak load of your website before a complete failure occurs.